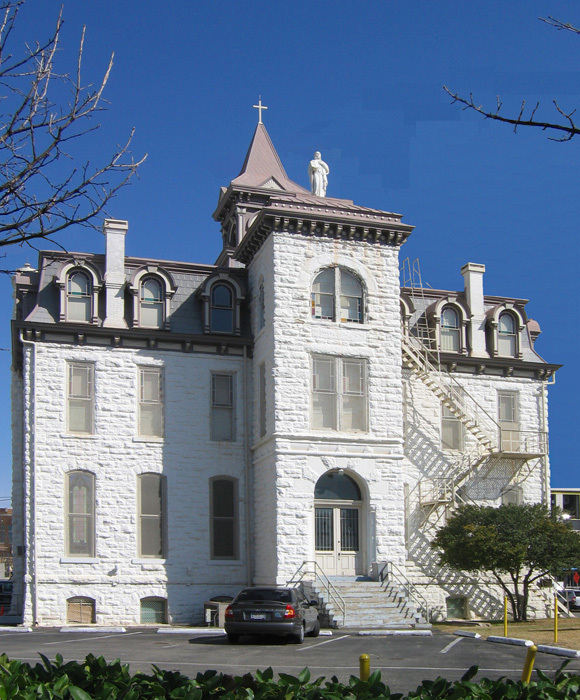 St. Ignatius School - Volz & Associates Inc.
St. Ignatius was one of the first Catholic schools in the frontier community of Fort Worth. Established in 1885, the burgeoning academy soon outgrew its original location and this French Second Empire style structure was constructed in 1888 adjacent to St. Patrick Cathedral. The four-story limestone building, with its prominent mansard roof and decorative tower, instantly became a Ft. Worth landmark. A restoration program for the School was defined in a Preservation Plan prepared by Volz & Associates, Inc. for the Cathedral Complex. We provided architectural services for the restoration of the roof of St. Ignatius, returning it to its original appearance.